The 16th Annual Appletree Automotive U.S. 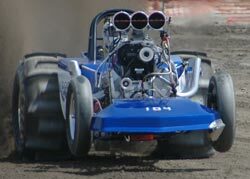 Sand Nationals at West Michigan Sand Dragway is complete after a weekend of great weather and close racing. Bob Piunti emerged victorious in the Top Fuel class defeating a four car field, while Troy Turnock topped a six-car class in Top Eliminator. We’ll have photos, video, and more coverage in the coming weeks from this event. The 3rd Annual Pro Truck Nationals at West Michigan Sand Dragway went down on July 19. There was a ton of excitement built around this race, and it did not disappoint. Let’s take a look back at this race through a “photo extra” with photos from our friends Mike Ellington (Sand Drag Central – www.sanddragcentral.com) and Rich Simon (Richard’s Auto Parts). What a great time to be a sand drag racer here in the Midwest. There are lots of events to attend, the weather has been excellent, and there is even a new race venue coming online this fall yet. 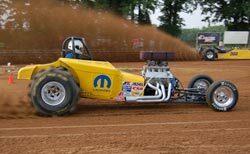 After some somewhat stagnate summers of late, it appears that sand drag racing is gaining back the momentum it had about 5 years ago. The 3rd Annual Pro Truck Nationals at West Michigan Sand Dragway is now complete after a great night of racing action. Brian McWethy ended up as the champion in the Fastest 4WD Shootout after a thrilling final round against Gary Vereeke with a margin of victory being mere inches. On the Pro Truck side of things, Bobby Hugo was the man taking home the $1000 first place money defeating Dave Kramer in the final round. Read on for full results and video. With things being a little slow in the month of July in the sand drag racing world, you may have noticed NSDN’s writers have taken the month off. Don’t worry, we’ll be back in full force at the start of August. With “The Editor” not having his column this month, there are a few notes of interest to share. - The July/August issue of Sand Sports Magazine is now on newsstands. As with every issue of Sand Sports, “The Editor” himself publishes the biggest stories from the sport in the “Sand Drag Scene” column. So, go out and pick up the latest issue at your local store, or better yet log on to www.sandsports.net and sign up for your subscription today. For a show that has often carried the name of "Summer Sizzler", the only thing sizzling Saturday night at Big River Sand Drags were the BBQ grills. The racing wasn't that bad either! 103 competitors from four states wide took part in the Independence Day weekend points race sponsored by Wies Drywall and Construction of St. Louis. When it got down to the money, it was a Show-Me State winners circle as you will soon find out. 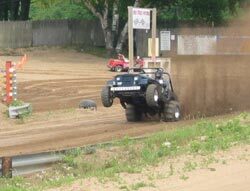 West Michigan Sand Dragway in Mears, MI is holding their 3rd Annual Pro Truck Nationals on Saturday, July 19. At this race, the Pro Truck class pays out $1000.00 for 1st, $500.00 for 2nd, $250.00 for 3rd and 4th while the Fastest Four Wheel Drive Shootout pays $1000.00 for 1st and $250 for 2nd. All other normal WMSD classes will also be run at this race. Below is the race’s radio ad/promotional video. 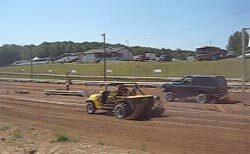 BONNE TERRE, MO – Big River Sand Drags was certainly the place to be last Saturday night as they hosted the Open 4x4 Nationals, an event established to promote the vehicle classes of the sport. Highlighted were the Open 4x4, Competition Eliminator and Vehicle E.T. classes. 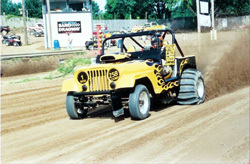 Open 4x4 is a class set up to run modified vehicles on a pro-light system. Information concerning the vehicle’s make up is used during registration to determine what, if any handicap to award the “slower” vehicle. Sounds kind of confusing, right? I guess that’s why some of the best drivers in the fastest 4x4’s compete in Open 4x4. It’s hard to believe that it is almost the middle of June and racing season here in the Midwest is in full swing. WMSD has had 2 events already, the oval tracks are running every weekend, and even the ¼ mile guys are running too. There is great racing to both participate in and attend as a spectator Friday, Saturday, Sunday as well as even some nights during the week around here. Needless to say, it’s a great time to be a race fan as well as a racer. BONNE TERRE, MO – Despite 90-degree temperatures and a one-hour delayed start, Big River Sand Drags managed to host a field of 65 racers through a steaming hot show in less than four hours last Saturday night. Pee Wee ATV featured a best 2 of 3 competition with Lee Bess of Bonne Terre taking first place and Justin Dee of Leadwood, MO second. The month of May was an exciting one for NSDN. We provided you with two NSDN Daily Race Coverage events and news/results from several other races. 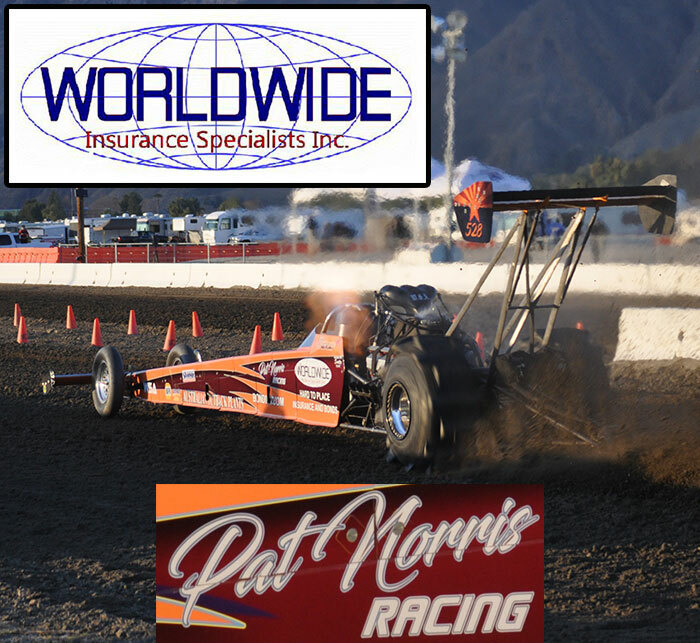 The first Daily Race Coverage in May was from the NSDA series at the Soboba Casino. Once again another great race was put on by the NSDA crew. One of the highlights of the weekend was the Racer’s Appreciation dinner put on by Sam and the C Fiesta Catering crew. They definitely provided some great food for all, and it gave everyone a great opportunity to get some bench racing in. That will have to hold us over until September, when the NSDA series picks back up again. The 10th Annual ASDA Heartland Nationals at Atoka Motorsports Park once again went off on Memorial Day weekend. This race once again featured warm temperatures and some great racing. A few west coast racers showed up to battle with the Oklahoma, Missouri, and Texas crowd to see who would take home the special trophies. This year, the race featured a benefit dinner for the late Butch Trolinder’s family in his memory. The trophies, provided by the Trower’s (also the dinner), were “Tie Dye” to in memoriam of Butch. Our friends at Lonestar Graphics (www.lonestargraphics.info) provided us with some photos from the race and coupled with a few of our own NSDN shots we’ll take a look back at this event in a photo recap. 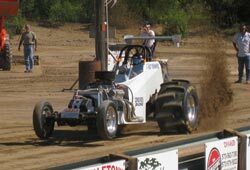 The NSDA made their second stop at the Soboba Casino in 2008 for the fifth point series race of the season. Sunny skies and pleasant temperatures greeted racers and fans for this event. With only two more point series races after this one to decide the 2008 NSDA champions, racers were putting up their best shot in position themselves for a shot at a championship. Read on to see how things transpired at this event.